Galactic Core - Universe Galaxies And Stars Section. Youth in the galactic core. 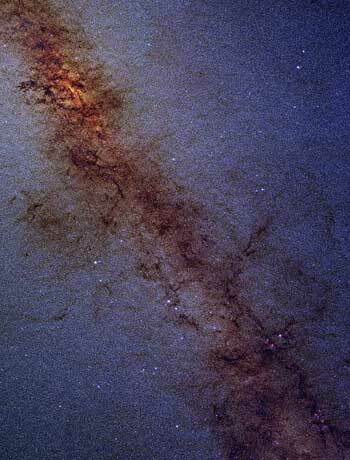 The Milky Way - like all spiral Galaxies - swings gracefully around a central super-massive black hole (SMBH). Astronomers have known for some time that a "fairy ring" of youthful blue-hot stars dance within a few light-years of its event horizon, but such stars should be very old and display expansive low-temperature red giant envelopes. Could there be a "fountain of youth" in the center of the Milky Way Galaxy? Most Milky Way stars - such as our own Sun - move in millions-of-years-long near-circular orbits unperturbed by the super-massive black hole (SMBH) in the midst of the galaxy. But at Milky Way Central stars can display unusually frenetic and highly eccentric motions. Those closest to the SMBH spend most of their time near aphelion - well away from its event horizon. But the SMBH's relentless gravitational grip soon draws them inward again toward perihelion. As these stars lose their footing in the SMBH's gravity well, they accelerate rapidly - only escaping total dissolution due to their extremely high orbital angular momentum. Such "S-stars" were first identified by two independent teams of Astronomers (one led by Reinhard Genzel at the Max Planck Institute in Garching, Germany, and the other by Andrea Ghez at UCLA) in 2002. Due to high concentrations of gas and dust enshrouding the galactic core, the teams had to detect these highly mobile sources using Infrared light. By looking for shifts in the spectra of the stars and determining how fast they moved in relationship to other objects, precise orbits could be obtained. In the three years since their discovery one S-star (S2) has nearly finished a complete orbit of the Milky Way's SMBH. But there is something very peculiar about S-stars. Based on current models of stellar evolution, these stars should be very old - but have somehow managed to retain all the characteristics of youth. Theoretical Astronomers Melvyn Davies of Lund Observatory, Sweden and Andrew King of the University of Leicester, United Kingdom have an answer: "Our picture simultaneously explains why S-stars have tightly-bound orbits, and the observed depletion of Red Giants in the very center of the Galaxy." Most stars seen around us (outside Milky Way Central) have well understood life cycles. These stars pass through a "main sequence" of development - originating as large, low-temperature bodies with smoldering central fusion furnaces and ending as small White Dwarves radiating "heat" as visible light while quietly chilling out in the twilight of their celestial careers. A star's destiny is primarily determined by its mass. Super-massive stars, (as great as 150 Suns) live very fast lives and survive for as little as fifty thousand years. During their youth, these stars exult as brilliant blue giants with surface temperatures as high as 30,000 degrees C. Meanwhile more modest stars such as the Sun live much longer, glowing temperately for 5 to 15 billion years at lower surface temperatures (5,000 - 10,000 degrees C). Within all stars nuclear furnaces provide the energy needed to create visible light. As a star matures, its nuclear furnace grows in surface area and it gives off more and more radiation. At a certain point core radiation pressure becomes so intense that the outer atmosphere of the star swells many times over. This diffuse low- temperature gaseous envelope tells Astronomers that a star is well-advanced in age and is approaching the end of its life-cycle. But there are no such "red-giants" among the S-stars at Milky Way Central. All stars are birthed in clusters and form associations. This should include S-stars near the SMBH. star clusters precipitate as a group out of large regions of nebular dust and primordial gas. Although cluster stars are bound together gravitationally, tidal forces from the center of the Galaxy can tear them apart over millions of years. Individual stars within such clusters then spiral inward toward the core of the galaxy. As this occurs, these stars should age to become "stars within stars" - highly radiant blue stellar cores enshrouded by hugely swollen gaseous red-giant envelopes. In their paper "The stars of the Galactic Center" (published March 21, 2005) the authors go on to say: "S stars orbit in a region where tidal forces from the central super-massive black hole prevent star formation." "A plausible alternative picture is that S-stars result from the sinking of massive stellar clusters toward the black hole by dynamical friction. However tides disrupt such clusters at distances much further out than the region of the observed S-stars. To supply the S-stars requires scattering into near radial orbits by gravitational interactions with other stars. However this process occurs on a timescale which would considerably exceed the main-sequence lifetime of such stars of the observed temperatures." writes the pair. Effectively, core S-stars must either be very youthful and delivered into the region of the SMBH by some unknown mechanism, or they must be much older than thought and somehow rendered "youthful" by interacting with the black hole and its immediate environs. Could there be a "fountain of stellar youth" at the center of the Milky Way Galaxy? "Stripping stars solves the birth problem. ", says the authors. "... the only stars potentially identifiable as Galactic Center Red Giants lose their envelopes and turn into S stars instead." Core S-stars have gone through a process of cluster birth and maturation similar to our Sun. Because they may be less massive than once thought (~ 1-4 solar masses), they've had more time to move toward the core. Driven inward by gravitational scattering from more massive stars, these aging Red Giants receive a cosmic "face-lift" - as black hole tidal forces strip away their outer shrouds to join other gases fueling the SMBH itself. Because of greater than once thought longevity, these lower mass stars have had ample time to arrive at the galactic core from more distant clusters. The fact that they have lost their shrouds explains their relative brilliance, high temperatures, and apparent youth. According to Melvyn Davies, "No, the Sun won't suffer the same fate. We are too far from the galactic center. We are about 30000 light years from the black hole; the stars getting scattered in have come from much closer in, certainly no further than about 3000 light years." Professor Andrew King adds, "The Sun has no close companion which could disturb its normal evolution. So it will eventually become a red giant and evolve into a run-of-the-mill white dwarf."